Since the day my precious minis were born nearly 3 years ago, I have called them my angels. While Q slowly morphed into nicknames of bug and punkin, E always stayed my angel. Perhaps, it was the very presence of the love she created in my heart and those around her that should have been my first indication that indeed the word angel would pertain to her in a way I could have never predicted. On Monday of this week, we got word that E would finally have a diagnosis. As I sat in a meeting laughing and joking with 3 of my most favorite colleagues, my phone rang. I instantly recognized the number as Cedars Sinai Hospital, having spent the last 3 years answering and phoning doctors to discuss the minis’ conditions. I expected the call to be from E’s High Risk Pediatric Doctor confirming her appointment for Thursday, so when the genetic counselor identified herself and sounded as if there was news that would fall out of her mouth if I didn’t agree to talk to her just then, I shifted uncomfortably in my boardroom chair and tried to disappear as I told her now would be fine to speak. I could feel my body temperature rising and my hands shaking as I tried to take notes about what she was telling me. In that moment, it was if she stepped behind a heavy steel door and was trying to ask me questions about if she could call anyone, if I needed anything, what time could I come in to meet with the doctors the next morning. My head cleared long enough to schedule the appointment at which point I looked up to feel the entire room in my moment. They were watching me. They all knew I was waiting and I could tell they too knew whatever I was hearing was not good. I looked into their caring eyes as I hung up the phone and started to cry. It was Angelman’s. 3 days later, I can’t seem to shake the fog that is following me and the sadness that fills every part of my body as I think about this new label. From an extreme high of E pulling herself up on the couch for the first time on Sunday when life and the future felt full of possibility because there were no boundaries or statistics on if she will talk, walk, live any sort of independent life to this feeling that my my heart is in pieces. I miss my bubble. I miss Holland. I had become quite happy in my Holland of unknown innocence with no labels, no statistics, no prognosis, only possibilities of whatever my imagination could create for her. Now, there are groups of people, studies, reference points. Yet, for E, today is exactly the same as 3 days ago when she pulled herself up for the first time. Her future is full of possibilities. Her innocence and spirit are in tact, it is mine that is slightly broken. People always tell me E is the happiest baby they have ever met. Angelman’s is often referred to as “Happy Baby Syndrome.” It’s this happiness, now having a label, being attached to a “syndrome,” that rips at me the most, for it’s this happiness that gives me strength. The happiness is pure light and joy and I suppose for my little angel, this is just what she is, pure love and light. A true angel. Beautiful like our baby girl. She’ll beat this because she takes after her momma and will allow nothing to stop her from reaching her full potential. Dear friend, I read about the condition Little E has and all I really can say right now is that I love you, and I know you’re going to do everything in your power to help her be her very best. I’m sorry that you got the news and this diagnosis. I wish I had more to say. Just know that I’m here, thinking about you, and praying for you and your family. Thank you El. Love to you my friend. Yes, indeed, and with all of you behind us all the time, sending love and thoughts and goodness she and we will make it through and will be amazing. Love you. Remember that her potential is no less today than it was a week ago without a diagnosis. A new label does not change her future. You change her future. My BFF has a daughter with Down Syndrome. She was the first among our group of friends to have a baby, and at age 22 she gave birth to a daughter whom doctors said would have a “limited” life. If they could see her now! Captain of her bowling team, avid theater buff, lovely young woman of 27. Her mother allowed her to reach her potential by trying, not by applying standards. E will blossom in her time. She will reach the fullness of her potential because you won’t allow anything less. Shake off the label and just look into her eyes. You’re still in the Holland you’ve grown to love. Lisha has expressed beautifully the thoughts I’ve sat here trying to formulate into words. I read. I choked up. I ached for you. And then I thought, she is the same little E who pulled herself up.She is the same little E who has already beat so many odds and predictions. She is the same little E who loves her mother, father and brother well, just as they love her. 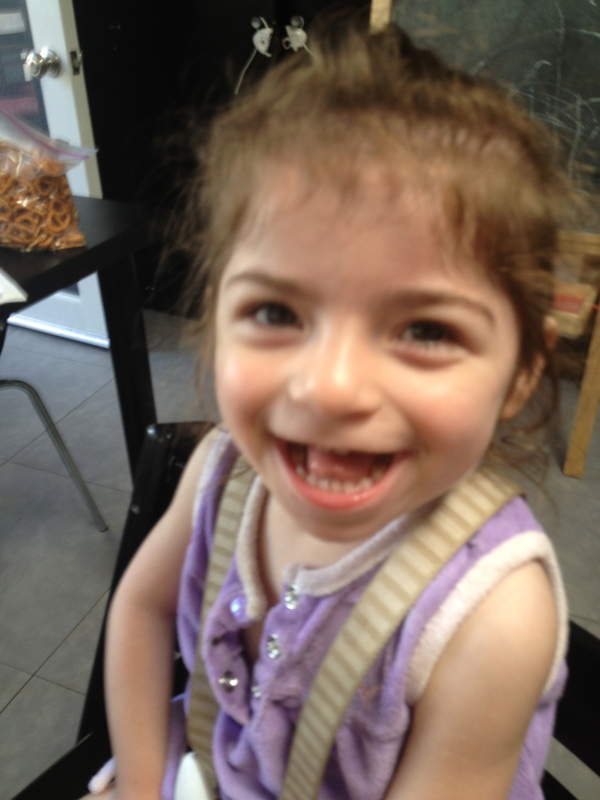 She is the same little E, the girl with a bright smile and joy to share,not because of a syndrome, but because of love. And Shannon, you are still the woman so full of courage, strength, and love. Yes, the world may feel dark right now with the advent of an official “diagnosis”, but please remember that you have a huge community holding onto the light and hope until you can reclaim them, as I know you will. I have never been a fan of labels – they can both help and hurt. Let the label help you to find the support both of you need, but don’t allow it to define her! E, with your help, will define herself and she will be so much more than a label. Prayers and happy thoughts to you and yours!! Thank you Theresa…yes, I think today I had that break through today…labels create perceptions, implant thoughts of what may or may not be, and today, I had just this moment to let go of that label. To use it for what it’s good for and to not let any of the other part her label define her or us. Thank you for your prayers and happy thoughts, they helped me more than you can know. I am thinking of you Shannon, I know that place of getting that phone call and having your heart drop. My daughter was finally diagnosed with a mitochondrial disorder and as much as it has turned my world upside down I have tried to stay anchored in that same fact that you shares. She is still the exact same little girl she was the day before that phone call.